by Rob - December 31st, 2016. Filed under: Reviews, Star Trek. 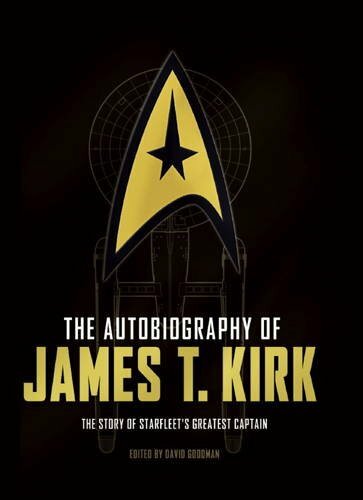 My on-and-off bathroom reading for some time has been David A. Goodman‘s The Autobiography of James T. Kirk. I just finished it, and I quite enjoyed it. Goodman took on two very difficult tasks. The first, obvious one, is making a coherent whole out of the contradictory mess that was TOS; the creators, after all, were literally making it up as they went along, and inconsistencies such as whether Kirk has three nephews or only one abound. On this score, Goodman succeeds in finding entertaining solutions that hold together and make sense. The second difficult task is a more subtle one. The brilliance of Star Trek was that the main character’s inner life was externalized: Spock was Kirk’s rationalism; McCoy was Kirk’s humanism. The triumvirate comprised three bodies but only one complete mind. To write an autobiography — a first-person narrative — Goodman had to give Kirk an internalized inner life, a monologue of his own thoughts. As “ghostwriter,” Goodman had to make a choice, and he did: he decided Kirk was not just a lonely man (a recurrent theme in TOS, best embodied in “Requiem for Methuselah”), but also a man plagued by regrets: for the lives he’d ruined, over the people who’d died because of him, for the careers of others that had stalled or ended because of his actions. It’s an interesting choice: a much more fraught, hand-wringy Kirk than we’ve ever seen before. As a reader, you can only decide for yourself whether Goodman’s depiction of Kirk’s inner life rings true. For me, it didn’t quite seem the Jim we’d come to know and love, but it was artistically an interesting choice, and I admired the integrity with which Goodman pursued it.